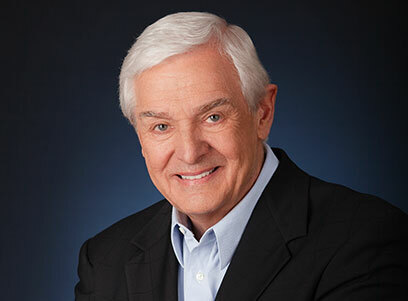 Dr. David Jeremiah, founder of Turning Point Radio and Television Ministries and senior pastor of Shadow Mountain Community Church, felt God’s calling on his life at a very early age. Born February 13, 1941 in Toledo, Ohio, Dr. Jeremiah was raised in a family deeply committed to ministry. At the age of eleven, Dr. Jeremiah and his family moved to Dayton, Ohio where his father, Dr. James T. Jeremiah, was the Pastor of Emmanuel Baptist Church, and in 1953 became the President of Cedarville College in Cedarville, Ohio. As Dr. Jeremiah was sensitive to God’s leading in his life, he followed in his father’s footsteps. In 1963, Dr. Jeremiah received a Bachelor of Arts from Cedarville College. In that same year, Dr. Jeremiah married his college sweetheart, Donna Thompson who also was attending Cedarville College as a business major. He went on to earn a Masters degree in Theology from Dallas Theological Seminary in 1967. He completed additional graduate work at Grace Seminary and was granted the Doctor of Divinity degree from Cedarville College in 1981. In 1969, Dr. Jeremiah began Blackhawk Baptist Church in Fort Wayne, Indiana, and developed a Christian school grades K through 12. In the 12 years he served as pastor, Blackhawk Baptist Church grew from 7 families to 1300 members. He also launched The Bible Hour television program. Dr. Jeremiah heeded God’s call, and in 1981 he and his family moved to California where he became the senior pastor of Scott Memorial Baptist Church, now Shadow Mountain Community Church. Shadow Mountain Community Church is one of the largest churches in San Diego County. It is also the home of Southern California Seminary and Christian Unified Schools. As Dr. Jeremiah began his ministry at Shadow Mountain, he felt God’s calling to continue the broadcast ministry he started in Fort Wayne. In 1982, Turning Point Ministries became a reality. Today, Turning Point's 30-minute radio program is heard on more than 2,200 stations worldwide. In recognition of Dr. Jeremiah’s commitment to teaching the Word of God, he received the Broadcaster of the Year Award in 1999 from the National Religious Broadcasters (NRB), in August 2002, received the Award of Merit from the Western Chapter of National Religious Broadcasters for Excellence in Broadcasting and Faithfulness in Service, and in 2006 Turning Point received the Best Radio Teaching Program Award. Turning Point launched a television program in 1982 in San Diego and went nationwide in 2000. Now seen around the world through cable and satellite technology, as well as on terrestrial stations all across the United States, conservative estimates suggest that close to 200 million homes around the world have access to Dr. Jeremiah's Bible teaching each week. Turning Point Television offers a half-hour Bible study message and a full hour worship service with the same great preaching. The program airs on national networks including TBN, ION, Daystar, INSP, USA, Lifetime, UPtv and ABC Family. Dr. Jeremiah is a sought-after conference speaker for organizations around the country. He frequently speaks at Cedarville College, Dallas Theological Seminary, Moody Bible Institute, Billy Graham Training Center, Phil Waldrep’s Senior Adult Celebrations, National Quartet Convention and numerous NFL, NBA and Baseball chapels. Along with his speaking schedule around the country, Dr. Jeremiah also finds time to fulfill another passion in his life, writing. His books are always gripping and right to the point. Some of his books include Escape the Coming Night, The Power of Encouragement, What the Bible Says About Angels, Prayer—The Great Adventure, which brought him The Gold Medallion Award in 1998, God In You, Gifts from God, Jesus' Final Warning, A Bend in the Road (now When Your World Falls Apart), Slaying the Giants in Your Life, My Heart’s Desire which gave him another Gold Medallion Award in 2003, Sanctuary, his first daily devotional book, The Things that Matter, The Prayer Matrix, Searching for Heaven on Earth, a book that he co-authored with world renown artist, Thomas Kinkade, The Secret of the Light, a second devotional book, Turning Points, Captured by Grace, which put Dr. Jeremiah on the best-sellers list for USA Today and The Wall Street Journal, Signs of Life, which made The New York Times best-seller list, What in the World Is Going On?, which made The New York Times, Wall Street Journal, and USA Today best-seller lists, The 12 Ways of Christmas, Living With Confidence in a Chaotic World, which made The New York Times, Wall Street Journal, Publisher's Weekly, and USA Today best-seller lists, The Coming Economic Armageddon, which made The New York Times, Wall Street Journal, USA Today, and Publisher's Weekly best-seller lists, I Never Thought I'd See the Day! Culture at the Crossroads, God Loves You: He Always Has — He Always Will, What Are You Afraid Of?, Agents of the Apocalypse, Agents of Babylon, People Are Asking...Is This the End?, A Life Beyond Amazing, and his most recent book, Overcomer: 8 Ways to Live a Life of Unstoppable Strength, Unmovable Faith, and Unbelievable Power. A dedicated family man, Dr. Jeremiah believes that without the support and encouragement of his wife, Donna, Turning Point would have never been brought into existence. He and Donna have four grown children and twelve grandchildren. Dr. Jeremiah's commitment is to teach the whole Word of God. His passion for people and his desire to reach the lost are evident in the way he communicates Bible truths and his ability to get right to the important issues. Dr. Jeremiah continues to be excited to see what God is going to do in broadcast ministry around the world through the Ministries of Turning Point.